Even thought I have been sitting down to meditation for a few years now, I do still struggle with it. My struggle is with all the voices that come up and believe it’s their time to be heard. It’s as if they have been waiting almost patiently for me to sit in stillness and then it’s their time to be heard. Instead of sitting in stillness, my head contains talk about seemingly very serious matters that have been unresolved or should be resolved or somehow are my business. There are opinions, judgements and loads of urgent advice and warnings. It’s bewildering how self-important my thoughts are, as if starved of attention until I sit down in meditation, sit down in stillness. This is the time when they know their voices will be the loudest and they will be truly heard. Yes, it’s exhausting to hear all that chatter especially since I know it’s always there, always fighting for my attention. It feels like a tug-of-war between my outer world filled with participating in life events and my inner mind which has an opinion (a very righteous opinion) about all. 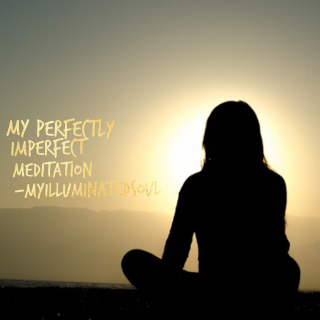 I turn to meditation to centre myself, to ground myself and connect to my soul and the entire universe. I love this connection; I embrace its value and meaning for my life. Part of me wishes I had more discipline to actually wake up earlier in order to sit in stillness of the moment, the house, the world and myself. And I do wake up early to do just that but it’s not consistent and I desire it more and more. I no longer want to feel so drained by my thoughts, so exhausted by their opinions. Yet I have learned not to fight with the monologue in my head, as struggle gives it greater desire to be of service, more certainly to be of use to me – those warnings of protection against the will of the world. So now instead of giving up, giving in and being the victim to my own fearful mind I just find ways to disconnect, to remain calm amongst the stormy sea of my mind. So, my dearest illuminated soul, I invite you to begin (or continue) your own journey to connect to your own path, purpose and life. Use your everyday events to be your guide, to give you a new outlook, to provide you with seamless resolutions. Observe your own life and look within to learn who you really are – you are not your chatterbox thoughts, or your seemingly imperfect actions. Go on your own journey of self-discovery, towards the truth, towards yourself, towards the connection to your life. Sing, dance, walk, laugh, cook or simply sit in stillness. There is no single, perfect way to meditate or do anything at all; there is only your way – the most perfect path of them all – just for you. Go out there and explore what will serve you, what will give you peace and joy. Then bring it to your life, make it part of your life and open yourself up to the journey into yourself and life connection.